Although Jack continued to hunt mule deer, Whitetail deer, ducks and geese, his next big game hunt didn’t happen until the age of 19, when Jack headed to Alaska for Dall Sheep and Caribou and Coastal Brown bear. Sheep hunting quickly got into his blood and Jack began a series of back pack hunts that took him from Baja California to Mongolia in pursuit of a number of different wild sheep species. It wasn’t until 1993 that he returned to Africa with his own children for a safari in South Africa. That safari reignited his interest in Africa. Along with a number of subsequent African safaris, Jack also hunted globally, seriously pursuing wild game found in the most remote corners of the world. Always having a strong desire to manage wildlife in Africa, as he did in the states, Jack thought becoming an outfitter in Tanzania seemed idyllic. Jack pursued this dream, offering hunters custom safaris on over one million acres of prime habitat with exquisite camps, unparalleled trophy quality and superlative hunting experiences. Jack’s desire to share these experiences led him to document his adventures through multiple video series such as the “Buck Fever” and “Ultimate Hunting” video series as well as the television show “Jack Brittingham’s World of Hunting Adventure”. Through these media outlets he was able to showcase these amazing places and hunts, as well as filming a variety of different wildlife and waterfowl throughout the world. 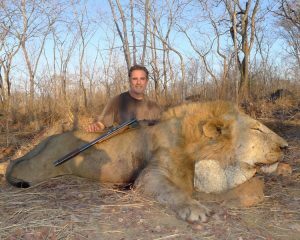 With over four decades of experience hunting and trekking the world, Jack shares his knowledge to help make a hunter’s dream a reality by arranging amazing destinations through World of Hunting Adventure, a consulting agency built on world class customer service and uncompromising attention down to the most minute detail. As one of the world’s most recognized big game hunters, the name Jack Brittingham is synonymous with archer, adventurer and wildlife conservationist. Fortunate to come from a family passionate for all things outdoors, from the time he was three, he eagerly tagged alongside his father on many adventures. At fourteen years old, Jack accompanied his father to Angola for his very first African Safari. On this hunt, Jack was able to take his first leopard, two Cape buffalo, and a mature elephant bull, as well as, many different plains game species. Rancho Encantado offers outstanding south Texas whitetail deer hunts and is located in the center of the famous “Golden Triangle” situated in the Southeast corner of Dimmit County, Texas. No location in Texas has produced more or bigger trophy whitetail. Originally the headquarters of the famous “Light Ranch”, Rancho Encantado was purchased in 1992 from George Light III. 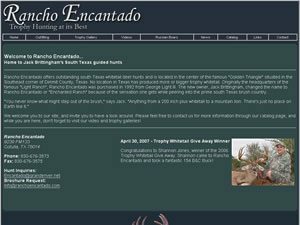 The new owner, Jack Brittingham, changed the name to Rancho Encantado or “Enchanted Ranch” because of the sensation one gets while peering into the prime south Texas brush country. Jack Brittinham’s latest outfitting opportunity. Details to be announced.